MPs will vote later on whether to block the UK from leaving the EU without a deal, after they again firmly rejected Theresa May’s withdrawal agreement. The deal was defeated in the Commons on Tuesday evening by 149 votes. The government will publish guidance for businesses on tariffs and proposals for the Irish border in the event of no deal on Wednesday morning. The cabinet is due to meet at 08:00 GMT. The EU said no deal plans were “more important than ever” after the defeat. Numerous EU leaders expressed their dismay after MPs voted by 391 to 242 votes to reject Mrs May’s deal. MPs will vote on Wednesday evening on whether to reject a no-deal Brexit. The prime minister said Tory MPs will get a free vote on the motion. That means Tory MPs can vote with their conscience rather than following the orders of party managers – an unusual move for a vote on a major policy. If no-deal is rejected, MPs will vote on Thursday on delaying Brexit by extending Article 50 – the legal mechanism that takes the UK out of the EU. The EU has said it would need “a credible justification” before agreeing to any extension. Leaving the EU in 16 days’ time remains the UK’s default position under the law. 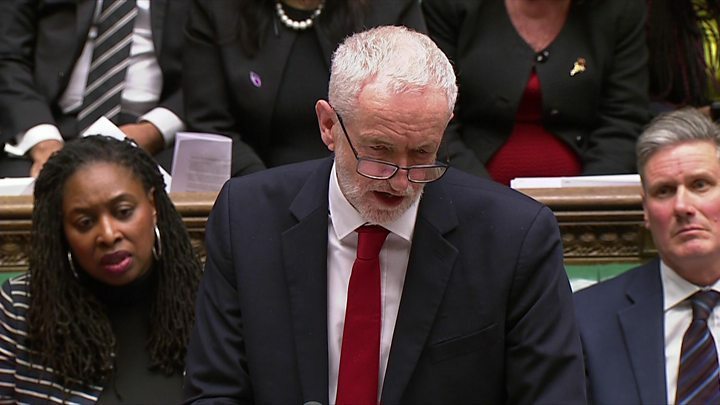 In the Commons on Tuesday evening, Labour Party leader Jeremy Corbyn said Mrs May should now call a general election. He called for no-deal to be “taken off the table” – and said Labour would continue to push its alternative Brexit proposals. But he did not mention his party’s commitment to back another referendum. The PM had made a last-minute plea to MPs to back her deal after she had secured legal assurances on the Irish backstop – the insurance policy to stop a hard border on the island of Ireland – from the EU during late-night talks in Strasbourg on Monday. But although she managed to convince about 40 Tory MPs to change their mind, it was not nearly enough to overturn the historic 230 vote defeat she suffered on the same deal in January. 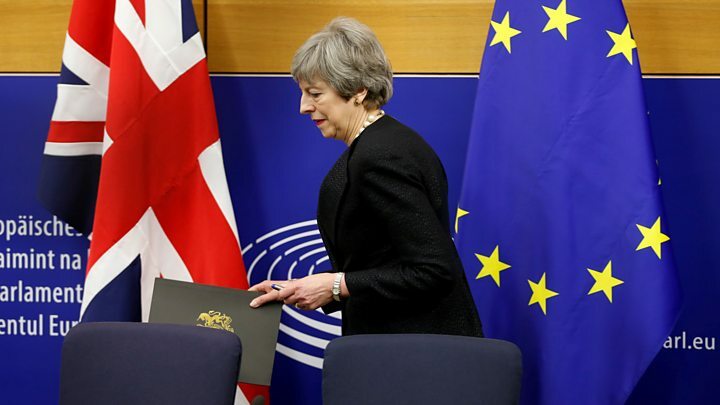 Speaking after the defeat and struggling with her voice, she said: “I continue to believe that by far the best outcome is the UK leaves the European Union in an orderly fashion with a deal. Mrs May said MPs would have to decide whether they want to delay Brexit, hold another referendum, or whether they “want to leave with a deal but not this deal”. She will tell MPs whether she will vote for no deal or not when she opens Wednesday’s debate. 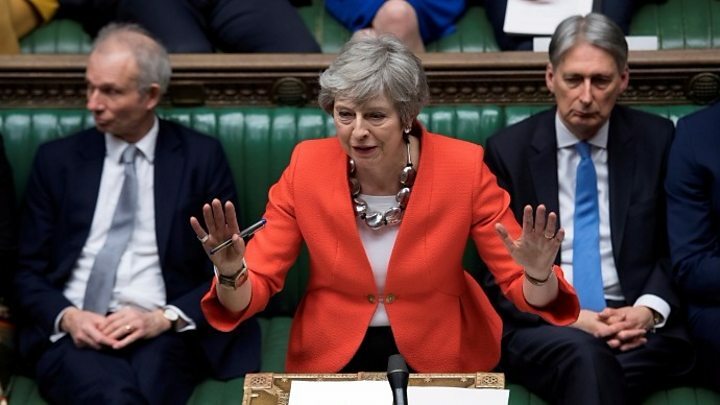 The prime minister did not discuss resigning after her latest defeat because a government led by her had recently won a confidence vote in the commons, the PM’s spokesman said. She has no plans to return to Brussels to ask for more concessions, they added. What isn’t clear is how the prime minister actually intends to dig herself out of this dreadful political hole. Some of her colleagues around the Cabinet table think it shows she has to tack to a closer deal with the EU. Some of them believe it’s time now to go hell-for-leather to leave without an overarching deal but move to make as much preparation as possible, and fast. Other ministers believe genuinely, still with around two weeks to go, and an EU summit next week, there is still time to try to manoeuvre her deal through – somehow. Jacob Rees-Mogg, chairman of the European Research Group of Brexiteer MPs, said he felt the rejected deal had not delivered on the commitment to leave the EU cleanly and that the backstop would have kept the UK in the customs union. Leading Conservative Remainer Dominic Grieve, who wants another referendum, said Mrs May’s deal was now “finished”. The DUP’s Ian Paisley said he would like to see the no-deal option left on the table in negotiations.